Laid down at the Slovenske Lodenice yard at Komarno on the River Danube in the late 1990s as ORTRUD MULLER, this ship was taken over while under construction, and completed for Erwin Strahlmann as PINNAU in 2003. One of the popular 'Rhein' class, she is 3,687 tonnes deadweight and is 87.97 metres overall. 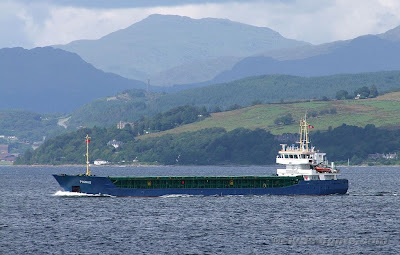 She was seen on Friday afternoon sailing with a cargo of scrap metal, loaded at Shieldhall, outward bound for Bayonne.